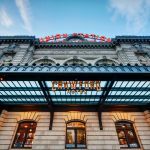 Kimpton Hotel Monaco Denver Colorado Review, should you stay here? 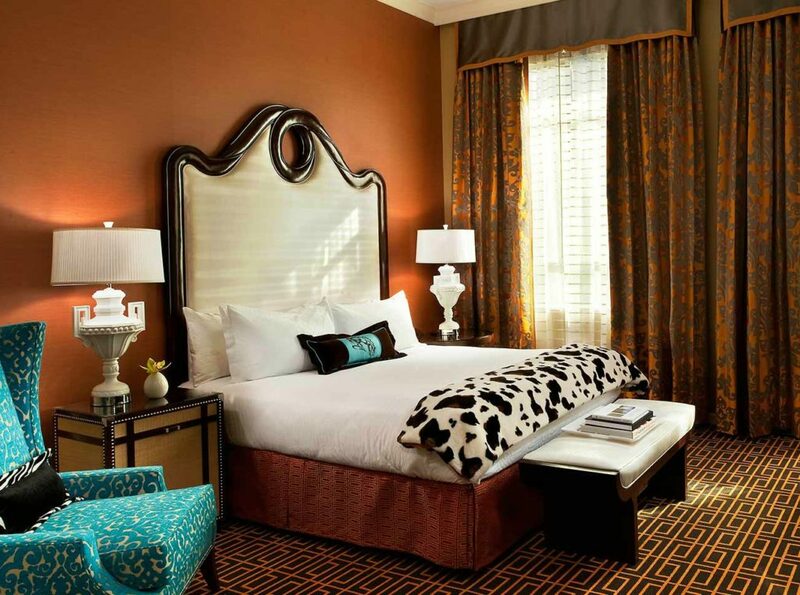 The Kimpton Hotel Monaco Denver is a colorful, dog friendly luxury hotel located conveniently downtown. 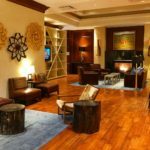 It’s within walking distance of Denver Union Station, loads of restaurants and pubs, Larimer Square and plenty of activities. It makes a great home base while you are enjoying the city. The lobby has a festive vibe with bright colors and patterns. 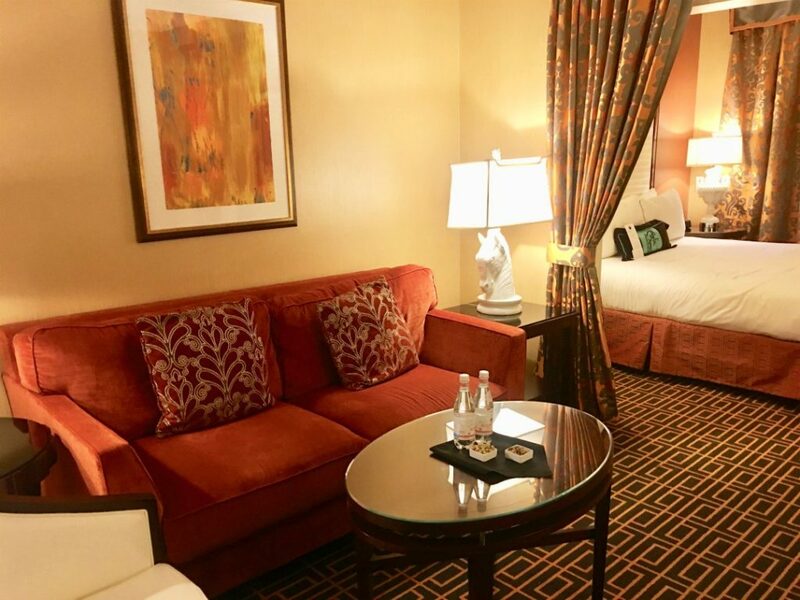 A super friendly staff is welcoming and will have you checked in very quickly. 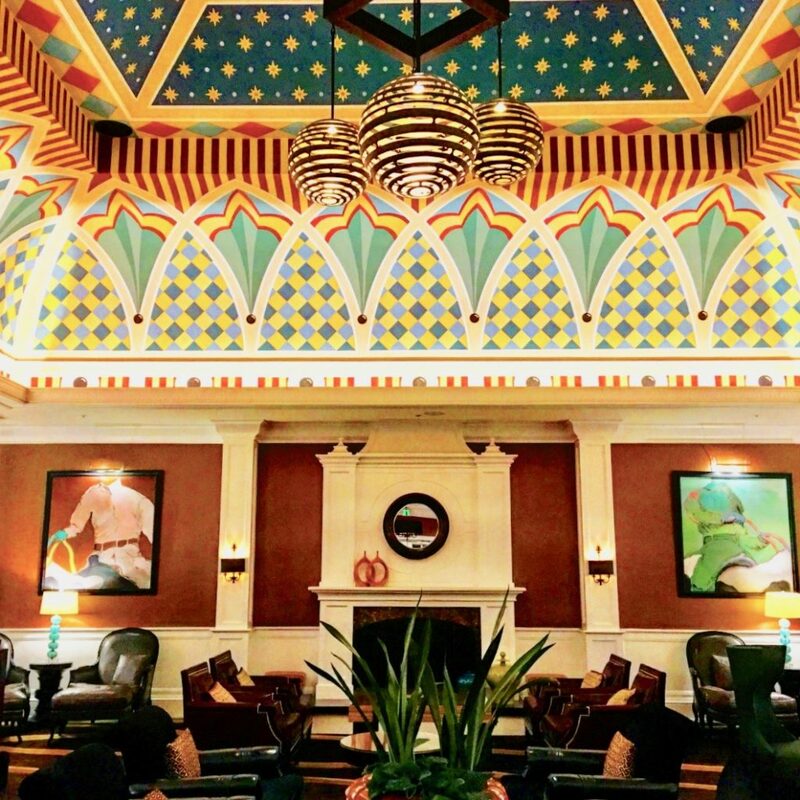 Not all Kimptons look alike, but this lobby reminded me very much of the Seattle Kimpton Monaco. And the service was just as good. In the mornings, there is a coffee station set up, and in the evenings they offer local wine and a chance to mingle with other guests. 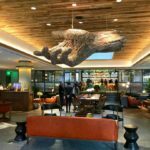 Kids love the color and whimsey Kimpton Hotels offer, like the big cow in the lobby hallway. 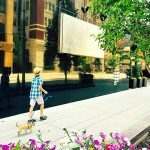 The Monaco in Seattle was my son’s first luxury hotel and he was completely hooked after that. They spoiled him with attention, treating him like an adult when he was four. He never forgot it. They had fun treats for kids, like a treasure chest full of toys and special food treats. He’s a little too old for the treasure chest now, but he still loves the goldfish. 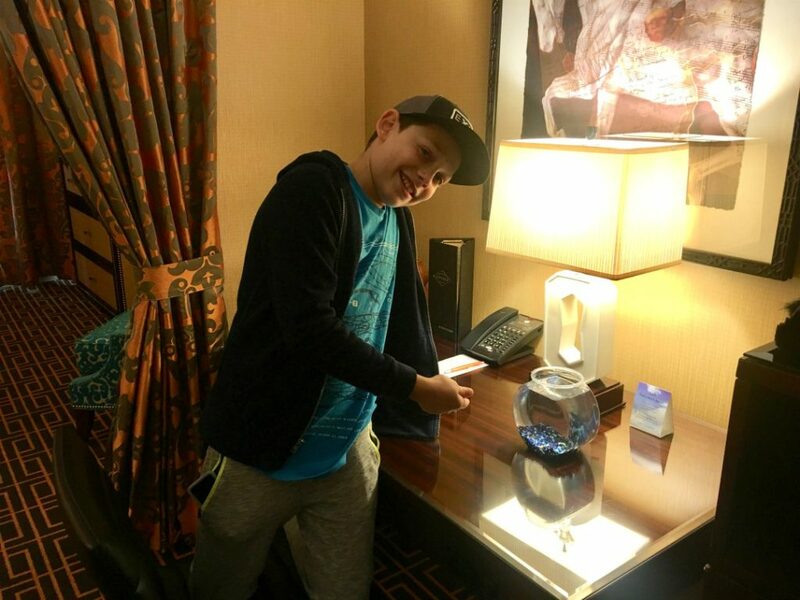 Kimpton offers real live goldfish for your room. They have names and my son still remembers his first goldfish’s name (Rina)! How fun is that? Just let them know you’d like one and it will be in your room when you get there. 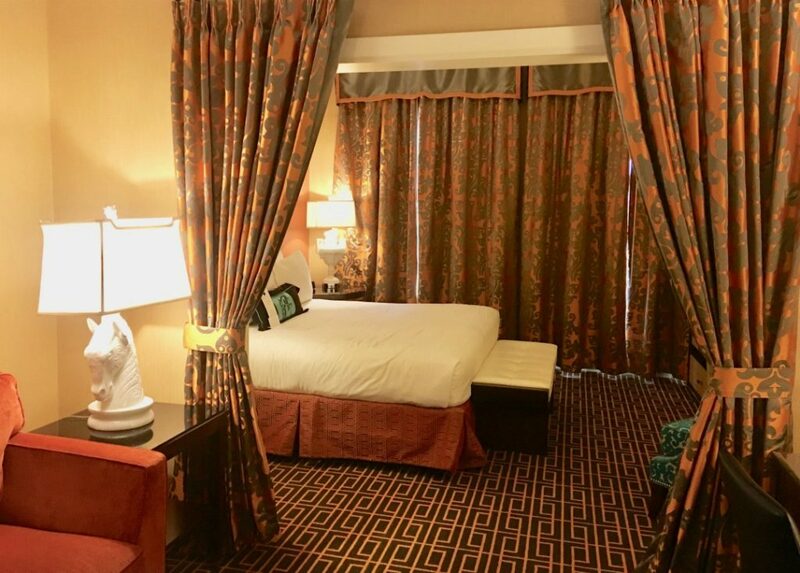 My son also appreciated the separate space in the suite, easily closed off with those lavish heavy weight damask curtains. We stayed in the Monte Carlo Suite with one King. The sofa opens up into a bed, so this is a great room for two people to have their privacy, or for a couple traveling with kids. Note that we stayed here at the end of the summer and they have since renovated some of the rooms (I cannot wait to see them) so be sure to check out the photos when you book yours. Even though our room was facing the street, it was extremely quiet. There was a big car accident right in front of our room with several emergency vehicles and we didn’t hear a thing. I only noticed because I happened to look out the window after the firetruck got there and saw all the flashing lights. Not a peep. People come to the Monaco just for the food. 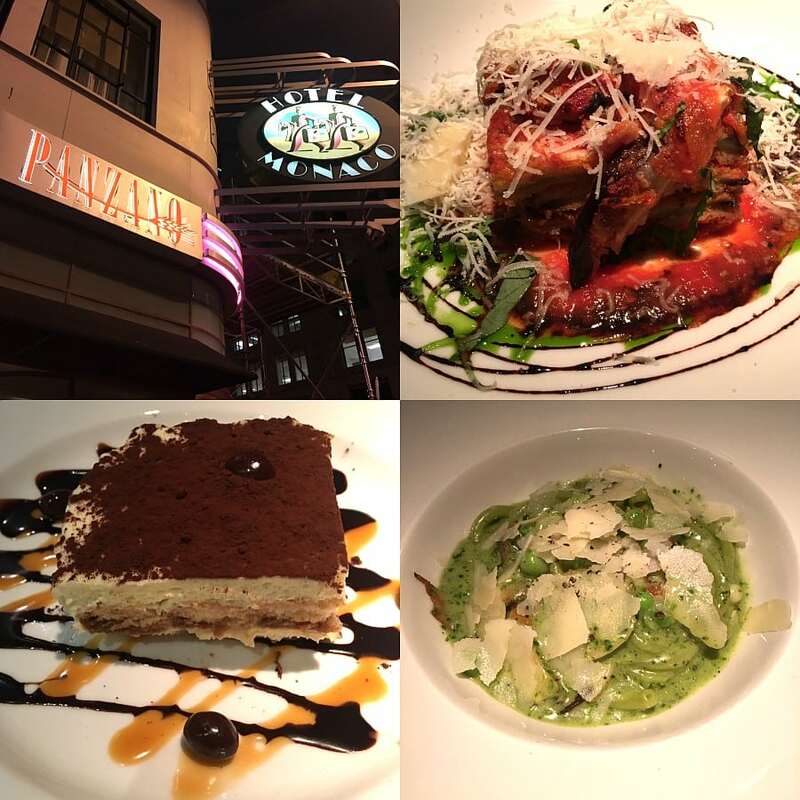 Panzano offers Italian cuisine using fresh local and organic ingredients. We tried a few things and our favorite was the Tiramisu–seriously some of the best I’ve ever had. Go hungry because this is Italian comfort food that requires an appetite. 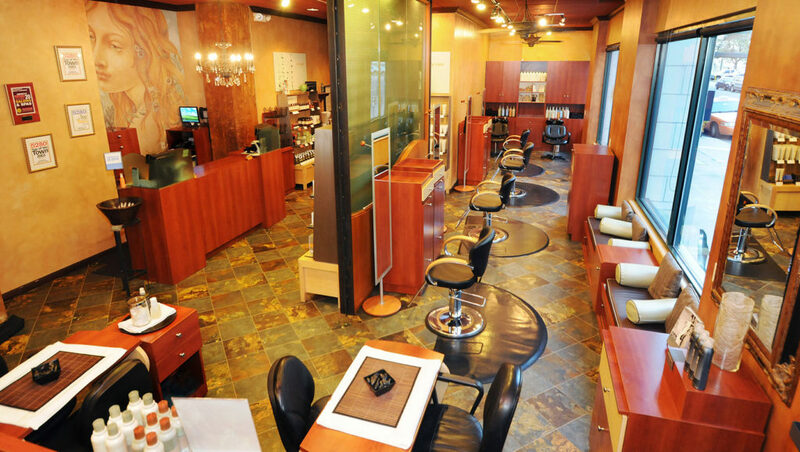 Located within the Monaco is the full service Veda Salon & Spa, so you can get a massage and have your hair done for a night on the town. This spa offers treatments using a Vichy Shower which you don’t find everywhere. I always go for the Vichy whenever it’s available, and here it is the key element of their signature treatment, the Total Body Elixir which is invigorating and will get you nice and energized. 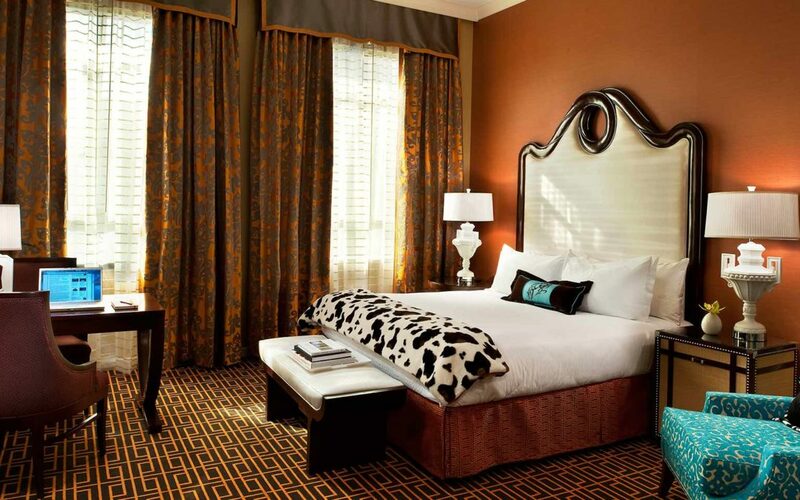 The Kimpton Hotel Monaco Denver is in a great downtown location within walking distance of the train station. They are dog friendly, kid friendly, and provide something a little different with their bright colors and quirky atmosphere. 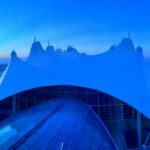 Find out more on the hotel website HERE. 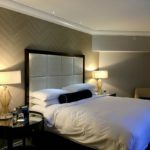 We were guests of Hotel Monaco, opinions are my own. Images 1, 8, 9 courtesy of Hotel Monaco.